Review published in IJPE, Vol. 5, No. 5, October 2009, p. 499.
teachers, have explained in the preface of this book that their primary aim behind authoring this book has been to familiarize a reader with the Taguchi's robust design principles and concepts in quality engineering and to relate it to Six Sigma, particularly for implementation of Design for Six Sigma (DFSS). The authors have presented several case studies to demonstrate this capability. The book actually combines classical experimental design methods with those of Taguchi's robust design principles since they believe that these strategies when combined would provide the most powerful approach for quality improvement and for product and process optimization. The reviewer has no hesitation to say that the authors have been largely successful in achieving this objective. The author has been largely successful in achieving this objective. 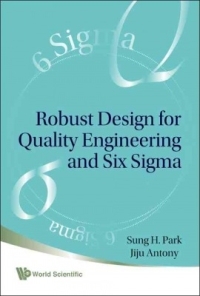 Lucid presentation in initial chapters of the book would found very useful and educative by the students who wish to get introduced to the subject and methodologies involved in quality engineering. The book has clarity and has easy to understand explanations, which will be liked by the engineers, researcher and students alike. The book is very well written and will be found as good reference material to the subject. The reviewer would like to recommend this book to the engineers and statisticians who wish to get familiarized with the subject. Review published in the International Journal of Performability Engineering, Vol. 5, No. 5, October 2009, p. 499. This review was published in the International Journal of Performability Engineering, Vol. 5, No. 5, October 2009 issue on page 499.